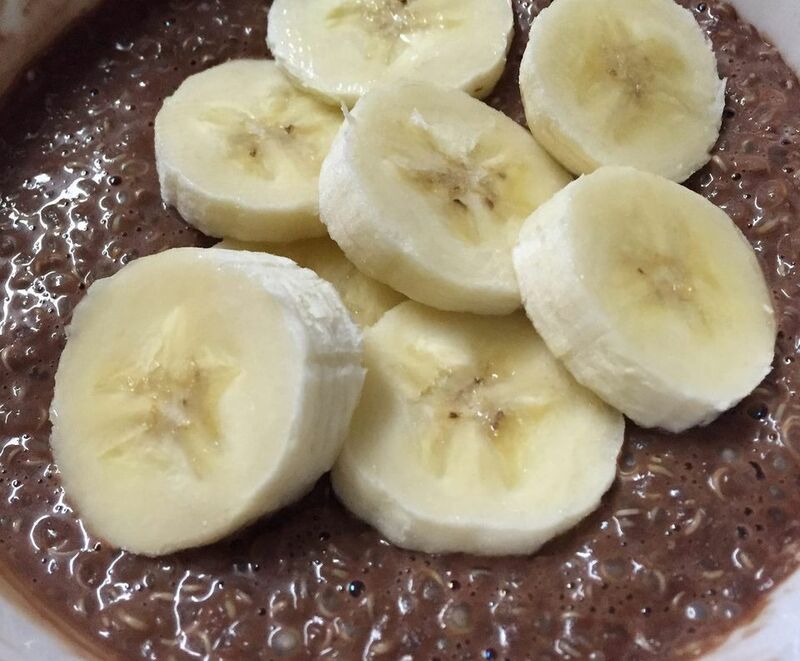 I love having chocolate for breakfast, and, I love having quinoa for breakfast, so this chocolate banana quinoa recipe is pretty much ideal for me. It's got plenty of healthy and low-fat protein from the quinoa, so it's perfect for vegetarians and vegans. Kids will love the chocolate and maple syrup, and parents will love the healthy combination of protein, fiber and fruit. This recipe is vegetarian, vegan, high in protein, refined sugar-free and gluten-free. If you're looking to omit sugar entirely, swap out the maple syrup for a tablespoon or two of your favorite nut butter. Yum! First, heat the quinoa and water stovetop for about five minutes. After five minutes, add in the chocolate soy milk, stirring to combine, reduce the heat to medium low, and heat an additional 5-7 minutes, until liquid is mostly absorbed and the quinoa is soft and fully cooked. You may need to add a bit more liquid as needed. Once the quinoa is fully cooked, remove the pan from heat and stir in the cocoa powder, maple syrup and banana slices. Add a dash of salt if you'd like, just to help bring out all the flavors. This recipe would also be delicious with some chopped nuts, berries, or even some peanut butter or other nut butter stirred in. For extra flavor, add in a light shake of cinnamon or a drop or two of vanilla extract. Note that though this recipe is free of refined sugar, most soy milks have sugar added in. If you're looking to reduce your sugar consumption, look for an unsweetened soy milk. You can use a regular (not chocolate flavored) soy milk in this recipe if you'd like, and just add an extra teaspoon or so of cocoa powder to make up the difference. Enjoy!